Today in an interview with the project founders of APOOS. 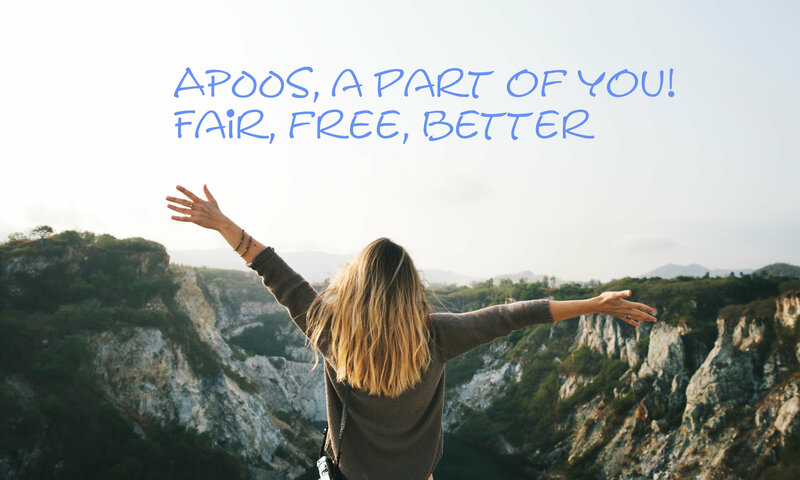 What is or what should be APOOS? The long-term goal is to create the first democratic fairtrade community with utility value and self-determined privacy with APOOS. APOOS starts where other projects have often reached their conceptual limits. Use all options on APOOS with just one login! Community with self-determined privacy and even across groups and divisions. Free basic membership – thanks to a broad concept -. Become a member in perhaps one of the most exclusive online communities in the world (Paid Club membership around EUR 30,000, -). Introduce products, dealers and projects. Networks with self-determined contact paths and even offline reference. Know where your data stays. Set up support projects and find supporters. Use Cloud advantages in a targeted manner. Find jobs, employees and life partners. Plan trips & discover tours. Manage your own content clearly and centrally. Find „real“ friends and sellers. Special blogs for special groups. Publishers & Journalists can offer articles and subscriptions. Use synergy effects of community and marketplaces. Build distribution networks and manage products. Use information management between customers and service providers. Offer or book a hotel, apartment, cabin or sleeping place. Use fraud prevention when trading in the marketplaces. Create your own shopping guide (regional, according to topics or keywords). Use professional search functions in the marketplaces for vehicles, partner search, real estate, jobs and more. Reach exclusive markets and contacts at home and abroad. „Buy function“, members can make limited bids. Multilingual: German, English & Spanish. When did you have the idea for APOOS? After failure of the first development start from 2008 – 2009, I decided in 2010 to go again on agency search. Now even more critical than before. The search turned out – as in the past – difficult, that interest in larger contracts with agencies in Germany was very reserved. So I decided to turn my gaze abroad. Under the heading „Offshore Software Development“ I came across the company DRC Systems from Ahmedabad in India. Despite my experience in the internet, I wanted to be a professional for this big project. An expert who knows about big projects. However, the search in 2007/2008 was difficult, most agencies do not answer my question. At the end I found an agency near Mannheim in Germany. A true expert, he also had a database specialist on hand via his network. He was optimally suited for the project and otherwise he was able to sell himself excellently. On the history of the original idea of APOOS. In 2003, I was traveling more often and became more and more concerned with the subject of websites. The proportion of sophisticated websites was rather low on the market and usually limited to one topic.